Although it may be one of the warmest months of the year in Toronto, August is also one of the busiest for local and international visitors flocking to the city to enjoy the last of the city's summer events. If you're planning to book a trip to Toronto during this warm and bustling month, do so in advance as hotel rooms, flights, tours, and restaurant reservations can fill up quickly. With warmer temperatures, you may want to turn up the air conditioning in your hotel room, but don't let the moderate heat put a damper on your good time. Toronto's multicultural communities shine this month with Asian, Caribbean, and Hellenic communities putting on festivals that will help you forget the heat in no time. Visitors coming to Toronto should expect hot, humid, and relatively dry weather for most of the month, but some rainy days and sudden cold fronts can help chill the hottest month of summer. While the average temperature in August is only 68 degrees Fahrenheit (21 degrees Celsius), highs can sometimes reach into the 90s, though the average high for the month is 80 F (28 C). Overnight lows can reach down to the upper 50s, but the average low for the month is 62 F (17 C). Although the weather remains mostly sunny throughout August (25 days on average), visitors can expect some rain, as Toronto averages six days of rainfall during the month. Humidity can also get quite intense—even on cloudless days—making the heat of the day feel more like the temperature is in the upper-90s. Since the temperature can fluctuate from a balmy 90 to a cool 58 degrees Fahrenheit at night, it helps to pack clothing you can layer, including a light jacket, and you'll also need to be prepared for rain so be sure to pack an umbrella and raincoat. However, since most of the month is hot and humid, you'll want to stick with lighter fabrics like cotton, linen, or silk to avoid getting overheated while you travel. Multicultural celebrations, free concerts and movie screenings, and a variety of community events highlight the events calendar for August in Toronto. From wine and food festivals like the Taste of the Danforth to special education programs at the Toronto Zoo, there are plenty of events to make your summer vacation even more memorable. Caribana: This Caribbean cultural festival features a parade, live music, dancing, and plenty of parties from August 2 to 6, 2018. Island Soul: Harbourfront Centre brings the Caribbean's finest musical, artistic, cultural, and culinary offerings to spice up your summer on August 3 to 6, 2018. Buskerfest: Street performers take over Woodbine Park from August 31 to September 3, 2018. Krinos Taste of the Danforth Festival: This celebration of Toronto's multiculturalism has a special emphasis on Greek and Hellenic cuisine and culture, running from August 10 to 12, 2018. Canadian National Exhibition: One of the largest annual fairs in North America taking place from August 17 through Labor Day Monday, September 3, 2018. Canada's Wonderland: Canada's largest theme park has special events all summer long. Waterfront activities are especially popular in August, and there are plenty of festivals to enjoy that are free to attend. 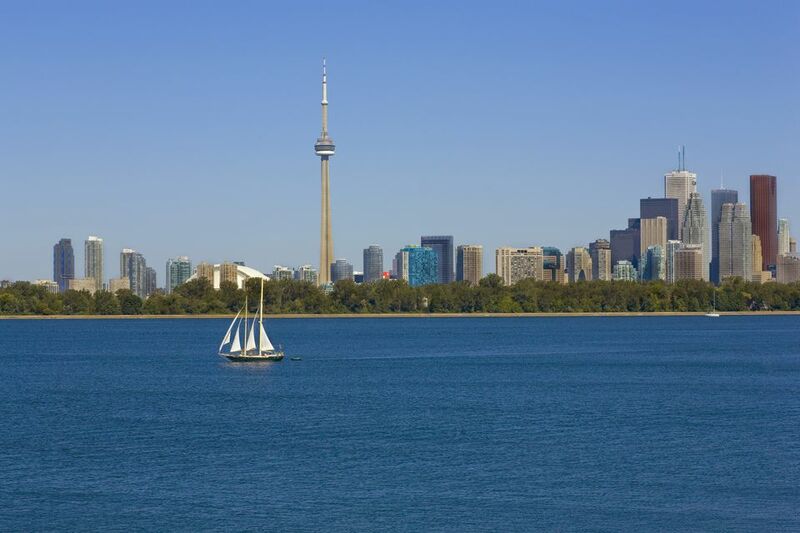 Summertime means the full throng of seasonal visitors has arrived, which means higher travel prices, fuller-than-usual hotels and restaurants, and possibly longer queues at Toronto's top tourist attractions. Summertime is patio season, so a nice way to beat the heat is to grab a patio seat while enjoying some local cuisine. The first Monday of August is Civic Holiday in Ontario (and most Canadian provinces), meaning that banks and most stores will be closed, but you should also expect larger crowds at public parks, pools, and beaches that weekend. Make sure to apply enough sunscreen and stay hydrated, especially if you plan on hiking or any other outdoor activity outside the city itself.